I am ending this theme with a simply beautiful piece of architecture. The architect who designed it is not a household name in western art history, but I think he should be. Dominikus Böhm’s designs are so simple and elegant, they define “modernism” for the period in which they were built. From the earliest Christian period in the West, architecture— especially religious architecture— was based on past styles for inspiration. This is what I consider the great historicist/revival nightmare of western art. The earliest church relied on Roman architecture, as did the Romanesque and Gothic. Renaissance and Baroque architecture, too, relied on the architecture of ancient Greece and Rome. This obsession with the primacy of classical architectural aesthetic was actually broken in the early twentieth century by German architects before World War I (1914–1918). Architects such as Peter Behrens (1868–1940), Ludwig Mies van der Rohe (1886–1969), and Walter Gropius (1883–1969) embraced the new machine age and sought to design architecture that updated it with industrial age materials and ideas. This virtually eliminated any historicist decoration. These architects introduced the glass curtain wall on steel cage construction, cantilevering, and the idea of a building’s design following its function. This was one of the beginnings of the modern skyscraper, as well as the advancements made in American architecture in the late nineteenth century [which, ironically, stuck predominantly with historicist styles, even on high rises, until after World War II (1939–1945)]. Dominikus Böhm (1880–1955) was a Roman Catholic church architect and vestment designer. Although his earliest designs reflect some historicist reference, by the mid-1920s his architecture contained Expressionist elements, such as textured facades, decorative brickwork, and geometric forms. 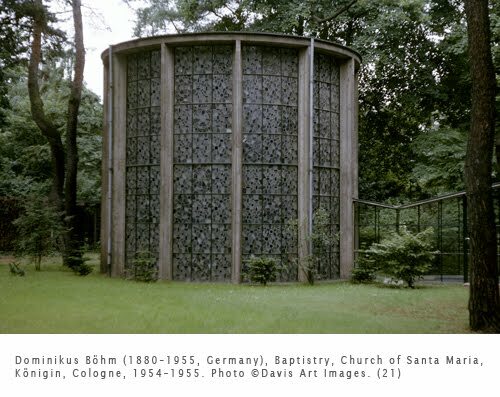 He continued to experiment with Expressionist reinterpretations of the Gothic style and produced many avant-garde churches in Germany. The experimentation by German architects was stamped out by the Nazis in the early 1930s. Because of the struggle to rebuild Germany after World War II, German modernist architecture did not fully revive until the early 1950s. This gorgeous little baptistery is part of a church complex that emphasizes huge, geometric expanses of stained glass. The simple vertical lines leading to a cornice remind the viewer of the sweeping vertical lines of Gothic expanses of stained glass, but with a clean, modern approach. In that simplicity, it is reminiscent of the curtain walls of early German modernist architecture. Correlations to Davis programs: Explorations in Art Grade 1: 1.1; Explorations in Art Grade 2: 6.31, 6.32; Explorations in Art Grade 3: 4.21; Explorations in Art Grade 4: 3.16, 3.18; Explorations in Art Grade 5: 2.11, 2.12; A Personal Journey: 8.1; A Global Pursuit: 8.1; The Visual Experience3: 11.4; Discovering Art History: 16.1.